A 'major incident' has been declared by the emergency services after 16 people were 'seriously injured' in a crash between a lorry and a bus on the A47 this morning. The East of England Ambulance Service Trust (EEAST) was called to Thorney Road, Guyhirn, following reports of a collision between a double-decker bus and an HGV. It was declared as a major incident because of the number of patients involved and the critical consequences to service delivery locally. Several ambulances and officers, two rapid response vehicles, a Hazardous Area Response Team (HART) and the Magpas Air Ambulance were sent to the scene. The clinicians cared for several injured patients, and have conveyed 16 to Peterborough City Hospital and Queen Elizabeth hospitals. MP for the area Steve Barclay tweeted: "Concerning news locally of road fatalities and injuries at Thorney Toll. If any constituents are affected and need support in the coming days please get in touch via my constituency office. The A47 near Guyhirn, is currently closed and people are asked to avoid the area or expect delays. Highways England have said the road isn't expected to open again until 1pm at the earliest. Ambulance staff have urged people only to call them in a genuine emergency while they deal with the incident. The crash involved a Brett’s Transport HGV and took place outside the firm’s base. Nobody from the company was is able to comment at this time while the emergency services continue to deal with the scene. 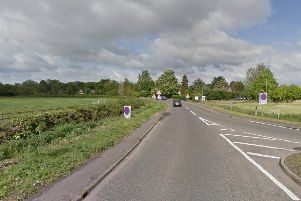 A spokesman for Cambridgeshire Fire and Rescue has issued the following statement: “At 7.33am on Tuesday crews were called to a road traffic collision on the A47 near Guyhirn. Police are appealing for witnesses to the incident to contact them on 101. A Cambridgeshire Police spokesman said: "We are appealing for witnesses following a collision on the A47 at 7.30am this morning. "Officers remain at the scene and the road is closed with diversions in place. "Anyone who witnessed the incident is asked to call 101. "Motorists are advised to avoid the area or expect delays."